I was on a discovery path in New York about a month ago, on my own. I love finding the heart of a new city in its book stores, as much as I like returning to my childhood bookstore every time I visit my hometown of Baia Mare, in Northern Transylvania. Therefore I was happy when my smartphone buzzed, announcing a new tweet message – it was from New-York based, Toronto writer Cate Kustanczy. She said that while I walk Broadway Southbound I should not miss Strand Books. Said and done! The bookstore is a marvel! It lays on 2 levels, and the aisles are as tall as Gulliver. You are completely sheltered between walls of books, but walking up the stairs one gets a beautiful penthouse view, too! 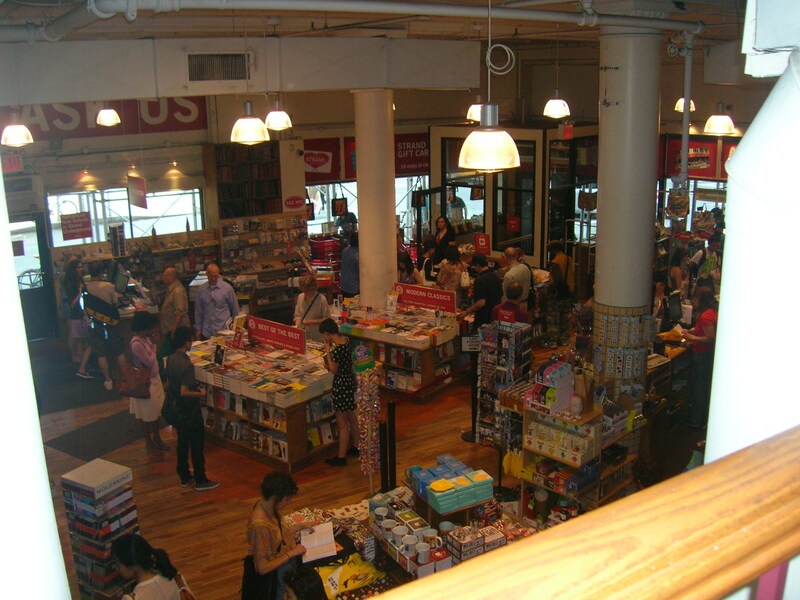 The lobby at Strand Books, in Manhattan, New York. The bookwalls are not captured in this view, they are as tall as Gulliver! Out of the frying pan (the Broadway buzz around Union Square) and into the fire (the thirst of the soul for good books). After smoothly melting into the mood, I applied my easiest test in the book to Strand: my American faves. Yes, they have John Irving (which went also well with my Canadian heart, as Mr. Irving owns a house in Toronto) (buy John Irving on Amazon Canada ). This test was a PASS. This might have been a tough test for such a popular place, but I had to run it anyway. This test was a FAIL. I left the store filled with joy and definitely enriched by a New York space I would like to revisit for a closer look. As I told Cate, while handing her “The Loser’s Club” as a gift, “I felt I could spend a day at STRANDS”.